SPRINGBOKS supporters still wince when reminded of it, but South African coaching staff will not be using the horrid memories of last year’s World Cup exit to motivate their team against the Wallabies. 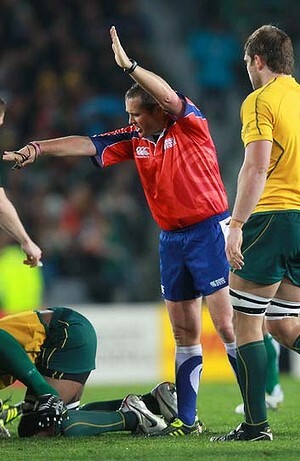 The Wallabies’ 11-9 triumph over the Springboks in the quarter-final in Wellington in October caused uproar in South Africa, with New Zealand referee Bryce Lawrence becoming the country’s public enemy No.1 after several dubious decisions went Australia’s way. The then Springboks coach Peter de Villiers was scathing, basically blaming Lawrence for his team’s departure from the tournament. However, de Villiers’ successor, Heyneke Meyer, has no interest in reliving that game, believing it has no relevance to the Perth Test on Saturday night. That might have a lot to do with only four Springboks who played in Wellington remaining in the starting line-up. ”I am not a guy who lives in the past,” Meyer said when announcing his Test line-up. ”There’s only Jannie [du Plessis] left from that World Cup forward pack, so I can’t use it as a motivation. But I also don’t believe in negative motivation. I instead know where we have to go, and we want to be the best team in the world. a 5th straight loss against Aus. Still makes me naar. I threw the TV out after that game and now have to watch online. Naar. Now we how the Kiwis felt. Naar.